F&C were given the heads-up on the launch of the GEX 125-150 random orbital back in February this year. At the time Bosch were making some fairly bold claims as to the effectiveness of their new system to reduce the level of vibration experienced by the user in operation. Without a machine on hand to experience the advance in technological innovation we had no other choice than to sit tight. put them away. Accessories, manuals and leads just never seem to go back the way they did when the box was first opened. The GEX is noticeably different from other sanders by Bosch's introduction of a filter cartridge as their choice of dust collector. It may be a slight exaggeration but probably not that far from the truth, but there are very few cars on the road these days that do not have at least one Bosch component on board. The thought could easily extend to household appliances so it's logical that there should be a degree of cross-pollination of ideas within an organisation that has that many strings to its bow. The dust cartridge on the GEX is derived from automotive air filters of which Bosch has extensive knowledge. A stroke of genius perhaps that begs the question why has it taken so long to make the connection. It's a rhetorical question of course and the answer is of little consequence because the result is so effective. The paper microfilter insert can be cleaned and the cartridge emptied by unscrewing one end of the tube. However, the development Bosch is most proud of is a system to reduce the effects of white finger or HAVS (hand-arm vibration syndrome). It's long been recognised as a serious industrial complaint with little defence other than to reduce the amount of time exposed to the cause. The patented system amounts to a decoupling of the motor housing from the sanding plate. To be more precise I would have to dismantle the machine and risk returning the GEX to Bosch in less than perfect working order, which is not something I'm keen on doing. Although short of a technical explanation for the science behind it I can list my findings as being totally gob smacked. As a result of this decoupling, Bosch have effectively improved the overall finish by cancelling out the effects of leaning into the edge of the disc. The tell-tale signs of rings or indents as a result of this are greatly reduced as any downward force is distributed more evenly over the sanding plate. The front grip on the GEX is removable to allow for flush sanding and the rubber overmoulded body is comfortable to use without it. Supplied in the box as standard are two sizes of dense foam sanding disc interchangeable with a single Allen key to suit your size of abrasive. The switch has a lock-on facility and the speed can also be varied. 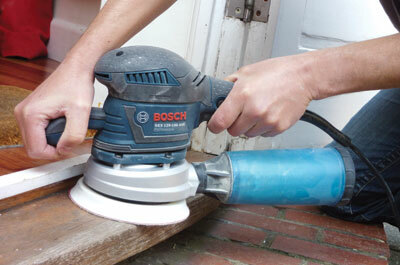 Last month we looked at an orbital sander from Mafell, which gained a similar reaction and the Bosch is every bit as impressive. If anything there is slightly more vibration detected through the front grip on the Mafell than the Bosch but I am talking slight. If I were in the market for a new random orbit this would definitely be on my list. Sanding pad size: 125-150mm dia.